A Ohio mother who allowed her 10-year-old son to get a tattoo and film it for a sad video that went viral to social media last week was arrested. 34-year-old Nikki Dickinson was arrested in Bellefontaine, Ohio, and was detained on Friday on charges of child abuse and crime involvement in a minor. 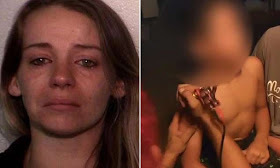 In a scary video that appeared online last week, her young son was filmed taking a tattoo from 16-year-old Kyle Richardson in immoral conditions at his home.